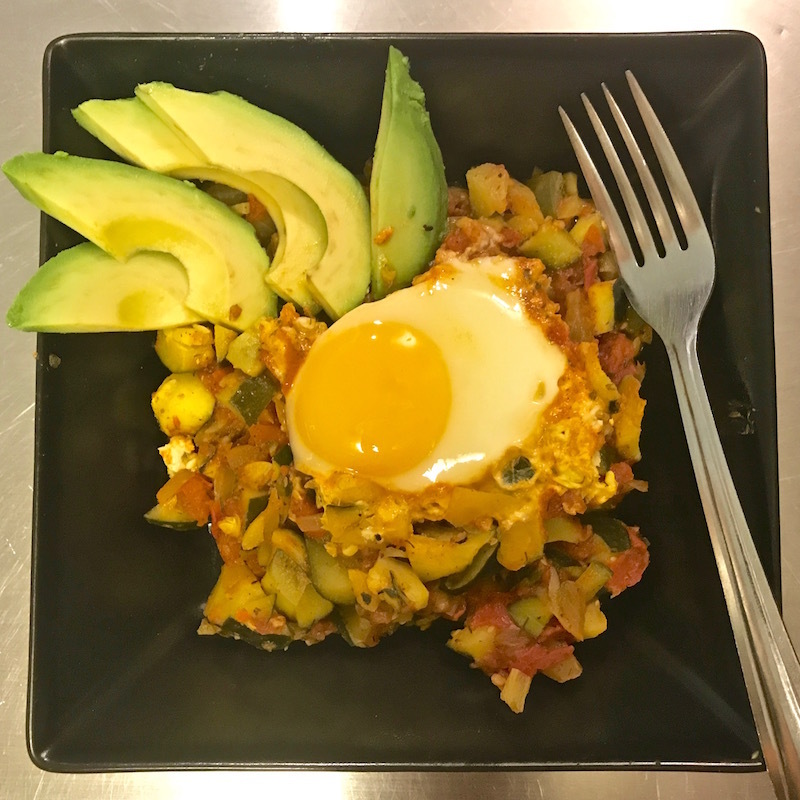 Eggs Poached in Vegetables | Keep It Up, David! Here’s a delicious meal idea for breakfast… or lunch… or brunch… or dinner… or for whenever you’re hungry! 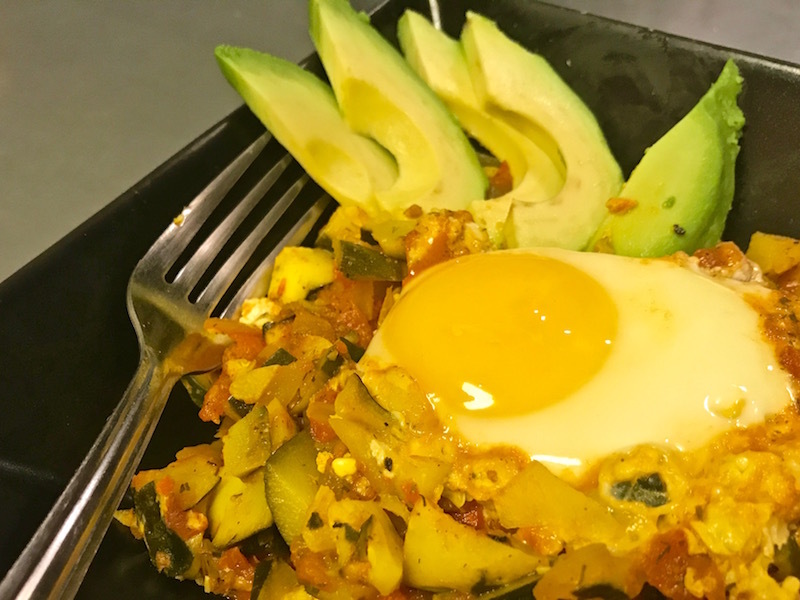 And it’s incredibly healthy, because you’re using vegetables to cook eggs! Just looking at that picture makes me hungry for this dish! You may recall I wrote briefly about this recipe last week, because my sister-in-law Alexis made it when I was up in the bay area. I learned how to make it from her; she learned how to make it from a website, and she told me which one, but I forgot. 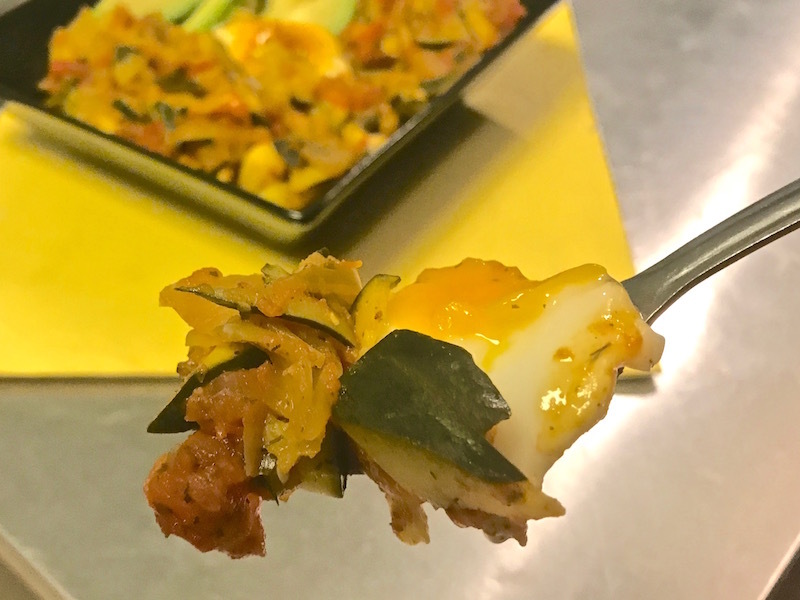 The version I’m sharing here differs from the one Alexis made, but as you’ll learn, this recipe is extremely versatile, so you can cater it to your own tastes however you like! Here’s how to make Eggs Poached in Vegetables. First, start with the vegetables. I diced 1/2 an onion, using a handy-dandy Tupperware vegetable chopper that I’ve had forever. I transferred the onion to a skillet I had heating over medium heat. 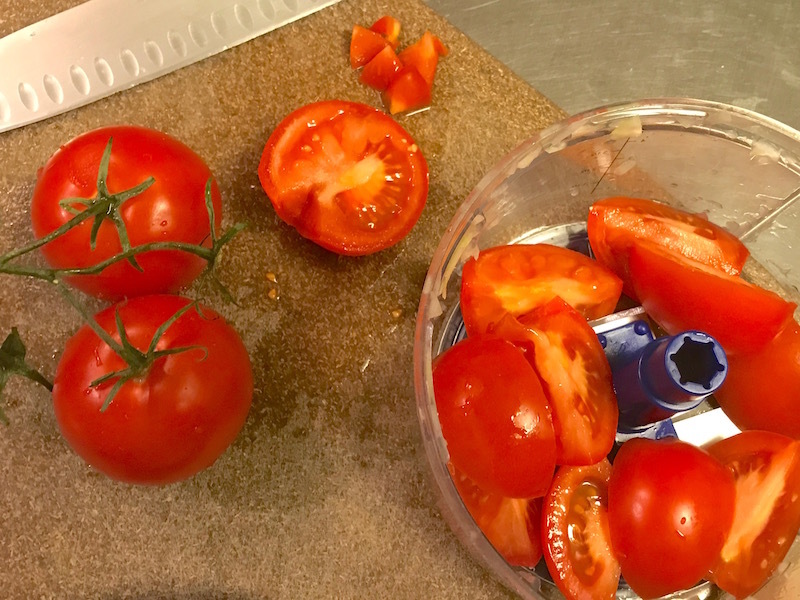 While the onion started to cook, I used the same chopper to dice up five on-the-vine tomatoes. 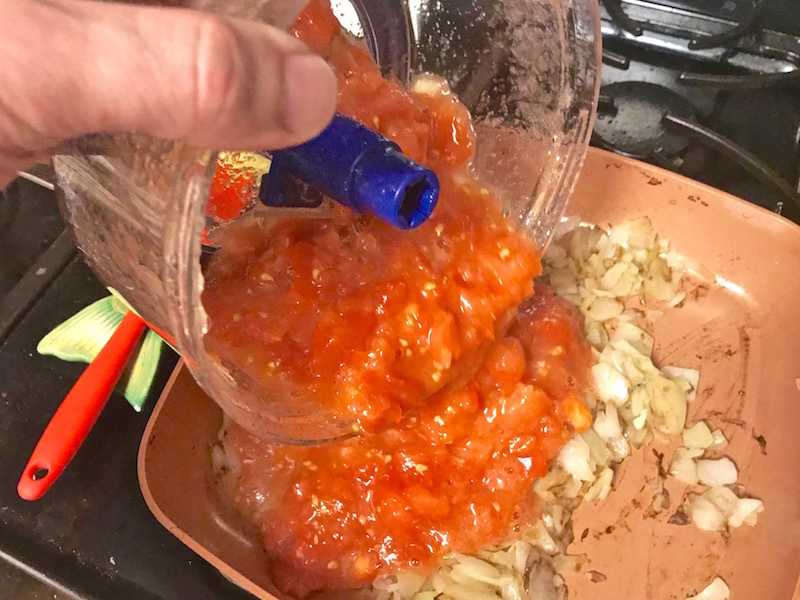 Tomatoes release a lot of water when you dice them, so I was happy to use my Tupperware thingie, because I could add all that liquid to the onions, which had started to soften by this point. 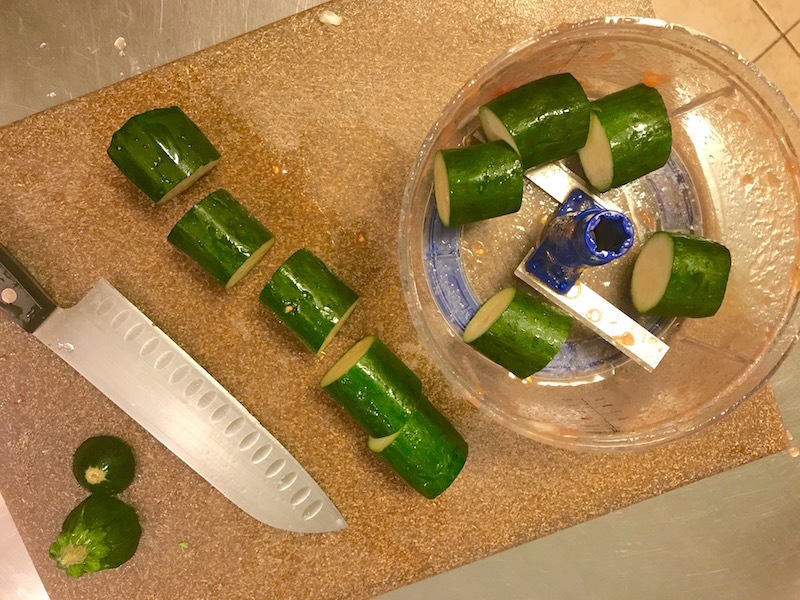 Then, I diced up two zucchini. After adding that to the skillet, I minced up two cloves of garlic, and tossed that in as well. 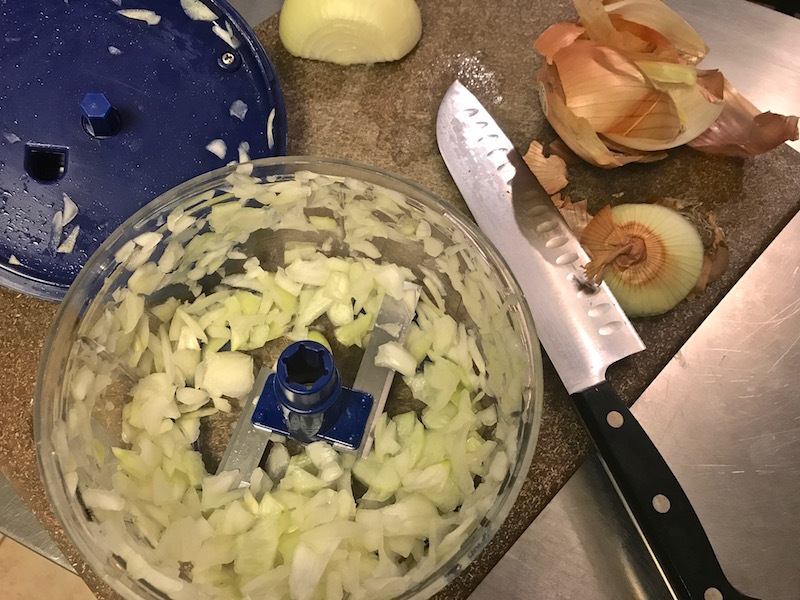 (I minced them using my knife; I know from experience my Tupperware chopper doesn’t handle garlic very well.) Finally, I seasoned the veggies with salt, pepper, dill, and turmeric. I used dill and turmeric because those are two spices that go well with eggs. Let the veggies all cook on the stove, until they get tender and delicious. The vegetables will release a lot of water, and you want that water to cook off, until the mixture becomes pretty thick. It may take about 20 minutes. You’ll know you’re ready to add the eggs when you can make a well with a spatula in the mixture, and it doesn’t immediately flood. Once the eggs have been added, DON’T TOUCH IT. No stirring, no jiggling, nothing. Once the eggs are cooked the way you like your eggs, you’re done! 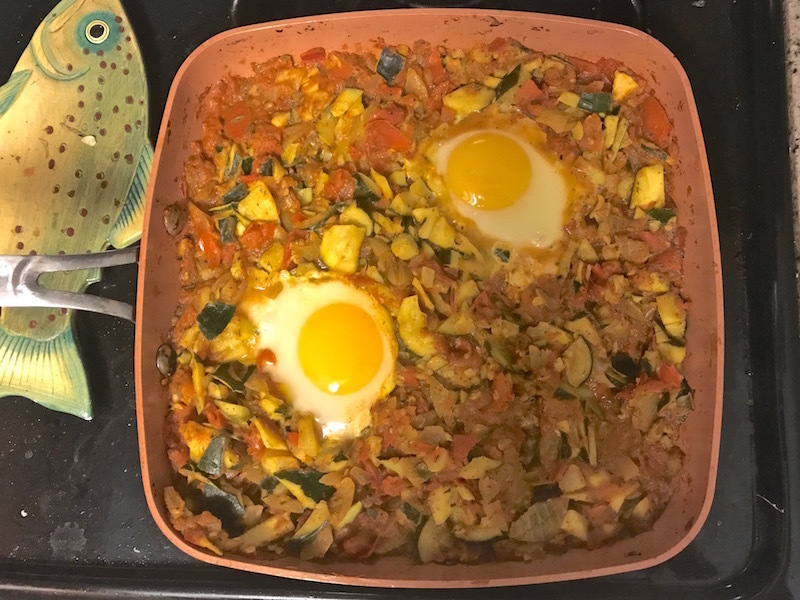 I wanted my yolks to be a little runny, so they’d spill out and coat the veggies. Then, scoop it up, and serve in a bowl! I added avocado as a garnish, because lots of things get better with avocado. The great thing about this dish is that you really can add anything you want. Alexis used onion, tomato, and riced cauliflower, and it was delicious. She also added half a can of stock (either chicken or vegetable, I can’t remember), and that added a lot of flavor, but also added to the simmer time, because it’s more liquid you need to cook out before you add the eggs. 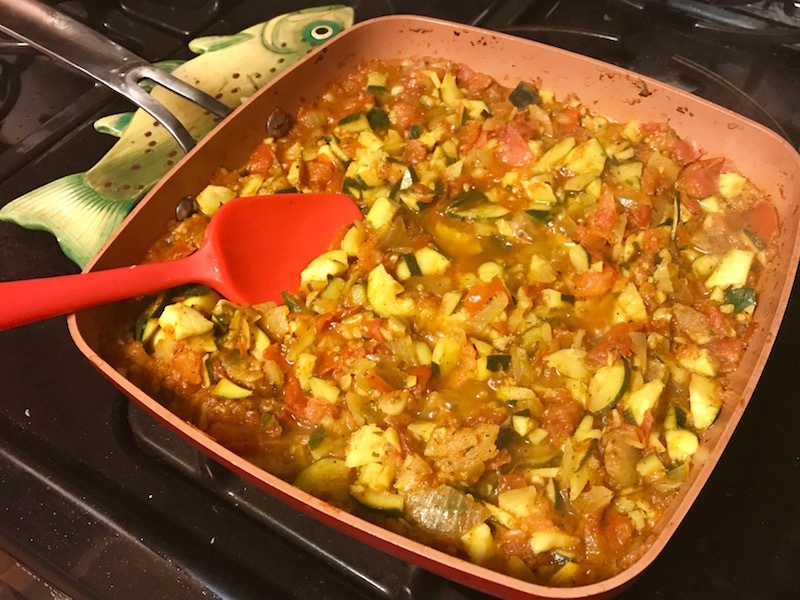 I used zucchini because I had some I wanted to use up. I was going to add broccoli, too, but I forgot to pull it from the back of my fridge. You really can add anything you have lying around: bell peppers, spinach, leeks. I’d say the only necessary ingredient are the tomatoes, which make the ideal base. Plus, you can bulk this up or shrink it down, depending on the number of people at the meal. 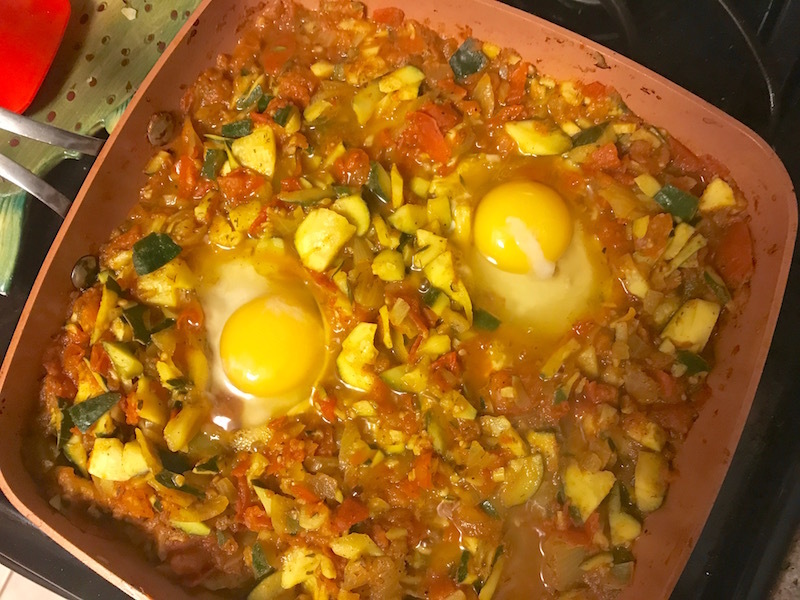 Use a bigger pan, and more veggies, and you can easily fit in 4 or 5 eggs. Or use a smaller pan and make a meal for one. It’s healthy, easy, and cheap. You really can’t lose! This entry was posted on Friday, May 5th, 2017 at 12:28 am and is filed under Uncategorized. You can follow any responses to this entry through the RSS 2.0 feed. You can leave a response, or trackback from your own site. A one pan meal is always a good idea and looks tasty too. I like the addition of avocado. Will be making this soon, yum!